Patriarch Alexei I (Russian: Патриарх Алексий I, secular name Sergey Vladimirovich Simansky, Сергей Владимирович Симанский; October 27, 1877 – April 17, 1970), was the 14th Patriarch of Moscow and all of Russia, head of the Russian Orthodox Church between 1945 and 1970. Born in Moscow to a noble family, his father was a Russian Royal House Chamberlain. In 1899 graduated from Moscow Imperial University with a law degree; was conscripted by the army and served in a grenadier regiment. In 1902 enrolled at Moscow Theological Academy and by 1906 became archimandrite and rector of Tula seminary. After the Bolshevik Revolution he was arrested several times and in 1922 exiled to Kazakhstan. In 1926 he returned to Leningrad and was appointed Archbishop of Khutyn, that is, the vicar of the Novgorodian diocese. He ran the diocese for much of the next seven years while Metropolitan Arsenius (Stadnitsky) was in prison or exile. In 1933 Alexei was briefly Archbishop of Novgorod (for several months) and then Metropolitan of Leningrad. On September 4, 1943, Alexei I together with a delegation of senior Russian Orthodox clerics met with Joseph Stalin in the Kremlin where a historic decision was made regarding the fate of the Church in the state ruled by the militantly atheist Communist party. In the midst of World War II, Stalin decided to allow the Russian Orthodox Church to function after two decades of severe persecution. The Patriarchate of Moscow was re-established and many churches throughout the Soviet Union were re-opened. Stalin tried to appeal to patriotic feelings of the Russian people, especially the peasantry who formed the backbone of the Red Army, many of whom grew up in still deeply religious families. On February 2, 1945 Alexei I was elected Patriarch of Moscow and all of Russia. 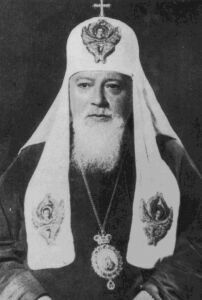 In 1946 Alexei I presided over the controversial "re-unification" of the Ukrainian Greek Catholic Church with the Russian Orthodox Church which was seen by many as a takeover forced by the Stalinist government. After 1958, Russian Christians led by patriarch Alexei I had to endure a new wave of persecution, mostly carried out through closing down of churches by new Soviet leader Nikita Khrushchev. Supporters praise Alexei I for working hard to ensure the survival of the Christianity in Russia, advocating peace and inter-church unity, while opponents often accused him of complicity with the Soviet authorities. Alexei died of a myocardial infarction at the age of 92 in 1970 and was buried in the Trinity-St Sergius Monastery (Troitse-Sergiyeva Lavra). This page was last edited on March 6, 2013, at 23:24. This page has been accessed 32,340 times.